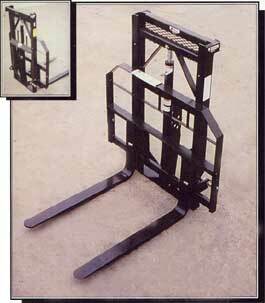 The Tebben 3 Point Forklift is designed to lift up to 4000 lbs utilizing the 3 point on your tractor. A 2 1/2" x 42" hydraulic cylinder allows approximately 70" of lift height with the TFL-2500-70 and 94" with the TFL-2500-94. Lift height is measured with the 3 point hitch fully raised. 1 1/2" x 46" Forks Adjust From 20" to 48"